CHICAGO--(BUSINESS WIRE)-- Hyatt Hotels Corporation (NYSE: H) announced today the official opening of Hyatt Regency Ahmedabad, the second Hyatt-branded property in Ahmedabad and the first Hyatt Regency-branded hotel to open in Gujarat state. Strategically located in the city center, Hyatt Regency Ahmedabad is within walking distance of the Sabarmati riverfront, only 20 minutes (9.4 km/5.8 mi) from the airport and in close proximity to the business and shopping districts. The hotel offers: 210 spacious rooms, including 19 suites; large meeting space options for corporate and social events; and multiple dining options to suit every occasion. Hyatt Regency Ahmedabad features 210 guestrooms including 19 suites, which offer a peaceful view of the Sabarmati River as well as the city of Ahmedabad. Ranging from 355 to 1,614 square feet, the guestrooms are contemporary and spacious. They are furnished in soothing shades and provide a refreshing elegance for guests to relax and revitalize. Each guestroom offers an ergonomically designed minibar; an iHome station with Bluetooth connectivity, digital clock and radio; a 40” LED TV; motorized curtains; and a spacious rain shower with a moveable wooden bench rest for guest convenience and comfort. China House serves the spicy cuisine of the Sichuan province of China. The original China House at Grand Hyatt Mumbai is an award-winning, trend-setting restaurant. The Ahmedabad version has been designed to resemble a contemporary Chinese home with unconventional interiors, stylish private dining rooms, semi-private booths and open areas. The in-house signature beverages and authentic and delicious dishes cater to discerning appetites. Tinello is an exclusive home-style Italian restaurant open for breakfast, lunch and dinner. The restaurant is designed like a living room with interactive food stations. The vibrant and chic Juniper Lounge is an ideal place for networking, informal meals and quiet business meetings. It serves an eclectic mix of Indian and international specialties in a relaxed ambience with hot and cold beverages as well as a special selection of farsaan. Adjoining the lounge is a well-stocked retail bar, offering a premium selection of aperitifs, spirits, world wines and beer, all of which are consumable in the comfort of the guestroom. Open around the clock, the Chai Shop is a casual tea and coffee house, serving a range of premium coffees, teas, fresh morning and evening bakes, an assortment of savories and exotic pastries. Guests can enjoy the Hyatt Regency brand’s ‘hotel within a hotel’ concept at Hyatt Regency Ahmedabad. Located on the 10th floor, the Regency Club is unique to the city and offers a stunning view of the Sabarmati riverfront and skyline. Guests staying in Club floor rooms can enjoy complimentary continental breakfast and evening hors d'oeuvres. Aadi Spa’s holistic approach toward health and fitness focuses on a balanced mind, body and soul. Guests’ health needs can be met at the hotel's recreational facilities, which include a Fitness Center equipped with cardio and strength training. Aadi Spa features five treatment rooms, a relaxation lounge and dedicated male and female wet areas. The wellness and relaxation facilities also include a 65-foot lap pool and whirlpool nestled into a landscaped garden terrace and a beauty salon. With the expected growth in Meetings, Incentives, Conferences and Exhibitions (M.I.C.E.) demand in India, Hyatt Regency Ahmedabad offers more than 14,000 square feet of meeting and event space, making it one of the largest hotel meetings and events facilities located in a five-star hotel in Ahmedabad. The spacious 6,045-square-foot Regency Ballroom with a 20-foot ceiling has an adjoining pre-function area. The ballroom can be further divided into two sections of 2,906 square feet and 3,132 square feet, respectively, for more intimate events. The hotel also offers two boardrooms, four meeting rooms and two flexible break away rooms that can be customized to suit guests’ needs. With this extensive range of facilities and a separate entrance option, Hyatt Regency Ahmedabad presents a perfect venue for a variety of events such as weddings, social banquets and conferences. The latest audio and visual equipment supported by a highly trained and dedicated team is on standby to take care of every detail and ensure the success of all events at the hotel. Hyatt Regency Ahmedabad will offer a special opening rate of US$90/INR 5,555/- for a limited period. During this time, guests can enjoy dining at Tinello or the Chai Shop and use the Fitness Center and pool. All other hotel facilities, including event space, are expected to open shortly. For reservations, please visit http://ahmedabad.regency.hyatt.com or call us at +91 79 4017 1234. The Hyatt Regency brand is an energizing hotel brand that connects travelers to whom and what matter most to them. More than 150 conveniently located Hyatt Regency urban and resort locations in over 30 countries around the world serve as the go-to gathering space for every occasion – from efficient business meetings to memorable family vacations. The brand offers a one-stop experience that puts everything guests need right at their fingertips. Hyatt Regency hotels and resorts offer a full range of services and amenities, including notable culinary experiences; technology-enabled ways to collaborate; the space to work, engage or relax; and expert planners who take care of every detail. 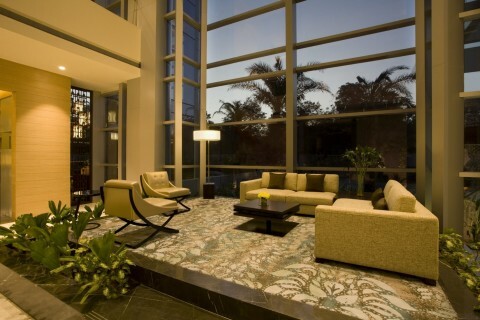 For more information, visit hyattregency.com or facebook.com/HyattRegency.